Last month, I received a lovely package from Mía Mariú containing 2 items for me to review. 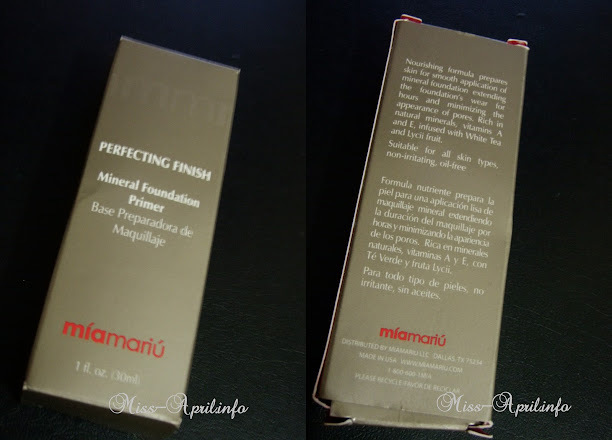 In this post, I will be reviewing their Perfecting Finish Mineral Primer. But before anything else, let me post a quick detail of who/what Mía Mariú is. Mía Mariú is a Texas based health and beauty company that promotes beauty inside and out. Mía Mariú botanical skin care, mineral cosmetics, natural health supplements and fine fragrances are available exclusively through Independent Advisers and online. The Mía business opportunity offers an innovative approach to social selling using the power of e-commerce, social networking and personal service. Women can easily balance their career and personal lives without sacrificing their time with family and friends. keeps my face matte/oily free all day (by all day, i mean from the time i put on my makeup until i go home from school, which is about 4-6 hours/day) – for reference, I have sensitive oily/combination skin. MOST IMPORTANTLY: I DID NOT BREAK OUT AT ALL! If given the chance, yes I will definitely repurchase. This is my very first face primer and I have to admit I have a lot of expectations. Mía Mariú did not fail me and provided me an excellent product that exceeded my expectation. Overall, I am totally in love with this product. I’ve been using it since day 1 that I got this (yes I used it immediately for school after receiving the parcel) and I still love it up to this day. FTC: I am not, in any way, affiliated/connected with Mía Mariú. I received these items mainly for product review. I was not paid to publish such review, thus everything posted here is my own words based on several tests I’ve made with the product. P.S. This is a new way of product review that I’m slowly starting to do. I haven’t been doing reviews lately, but expect a lot of it before 2012 ends. Let me know if this style of review is okay and if I was able to fully give a lot of information about the product.